On the other end of the phone line, Natalie Holmer’s voice was sparkling with enthusiasm. 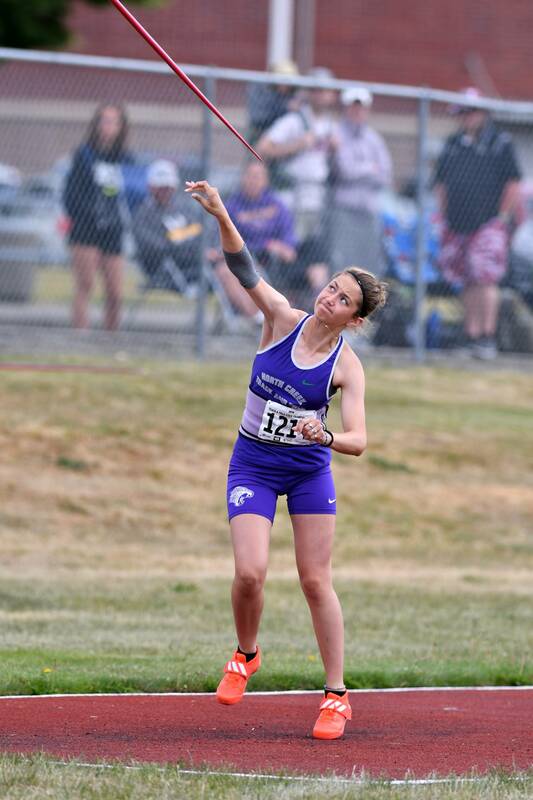 “I’ve been excited all day,” the North Creek High senior beamed the day after she unleashed the top high-school national female javelin throw this season of 147 feet, four inches on March 20 at Bothell High, according to athletic.net statistics. Her previous best was 130-4, which she threw at the Shoreline All-Comers Meet in 2017. Last year, she took sixth at the 4A state meet with a mark of 124-4. After her huge throw, Holmer eagerly watched the judges as they kept pulling the measurement tape to where the javelin landed. “It was a moment, it really was,” she said of her reaction. Holmer was coming off an injury to her right elbow on her throwing arm and wasn’t expecting to notch such a mammoth throw on that day. “It really just clicked. I just went for it,” said Holmer, who wore a compression sleeve on her elbow. Her arm felt fresh and ready to go. She’s been eyeing a state title since she was a freshman and is as hopeful as ever that it will be within her reach. The state record javelin throw is 152 feet. North Creek head coach Nicole Luckenbach said that Holmer — a team captain — displayed patience and they took the necessary steps to get her back and throwing after her back injury. In the offseason, the coach added that Holmer put in tons of training, attended clinics and she was set to set perform well this season. During the first week of practice this season, Luckenbach said that Holmer’s mechanics were on point. Holmer also pole vaults and hit a personal record of 7-6 on March 20.